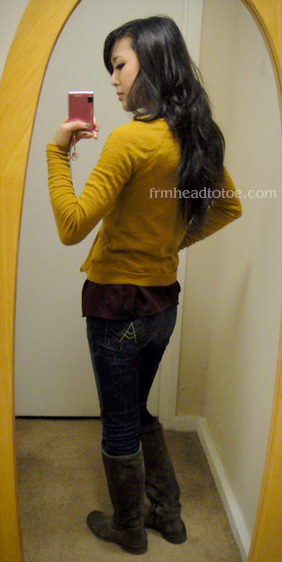 I wanted to show the back of the outfit because I hand washed the cardigan in hot water to shrink it. You can see it fits very well now! Before, it was a bit baggier on the torso but now it's perfect. OMG, it shrank beautifully! I'm going to try to shrink mine too, but want to get a few more wears out of it first before I take the big plunge. Shrinking things always makes me nervous! wow, great job shrinking the cardi! 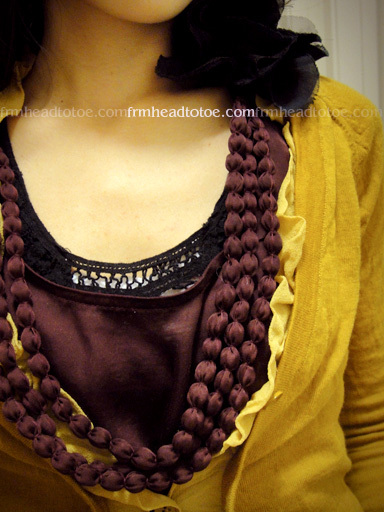 it fits you perfectly now and the gold color is beautiful against the darker colors of the top underneath. and i'm loving those boots too as they don't look too big or tall. what a lovely outfit! How did you dry it? Lay flat? I think I'm going to try your tip and handwash in hot water ... I want to get rid of my cardigan (same one( because it's poofy in the torso. super cute outfit! !1 i love the mustardy yellow on u!! That cardi is wonderful. J Crew has the best cardis, but I always find their quality a bit dubious. I'm not quite as small as you, but I do find things from J. Crew are sized up, rather than true. I have this dream of putting on chiffon "fins" on the shoulders. I love that Saffron Green/yellow color on you. I love your cardigan. 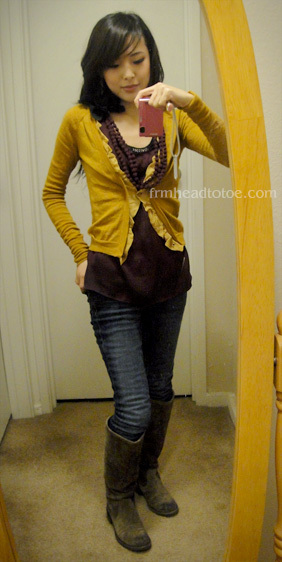 It's a nice girly twist on the basic cardigan and the color is pretty. How come you always manage to find the boots that actually fit! I still have all 4 colors of that cardigan because I couldn't decide which one(s) to let go of. Good to know it shrinks so well, because it's a little baggy on me still. hey jen, i'm around 5'2 but i'm really skinny and frail lol. i always have a super hard time finding jeans and boots that fit my legs. do you run into the same problem because i was wondering how do you find boots that fit your calves so it doesnt look like your legs are floating in the boot -____- lol. and i see that you purchase jeans from the kids size, i dunno how they would fit compared to women's jeans for waist size... just wanted some tips on how you shop for your size.. you're a lot smaller than me but it could possibly help :) thank you! Love your color. Will copy you. Love the blog, its amazing. You've inspired me to keep looking for clothes that are cute, because I'm a little smaller than you at 4'8" and 70 pounds. Maybe I can try shrinking my cardis! Thanks for the great idea. Also by any chance do you know where I can purchase Vanicream? My skin is super dry and I can't seem to find it anywhere. i agree with your staples - those are my F/W weekend standbys as well. and it's all about color and texture to make it interesting. and great job shrinking the cardigan! i'd be way to scared to try that, haha. I LOVE your OOTD posts! In my opinion, you are *by far* the best petite outfit blogger around, and I wish you'd post more. :) This post was a bit similar to other bloggers, but overall, I love your creative, youthful, mix-n-match style. I don't think you need to change anything. Just keep being your unique self! Hi Jen...just wanted to see whether you have tried eyelash extensions and what your thoughts are...does it work for monolids? Cute! I think my sweater said to dry clean it; how is it holding up after the dunk? I love your outfit! Pretty as always!